Explore this beautiful and diverse land and its tourist attractions in a royal style just like a king! 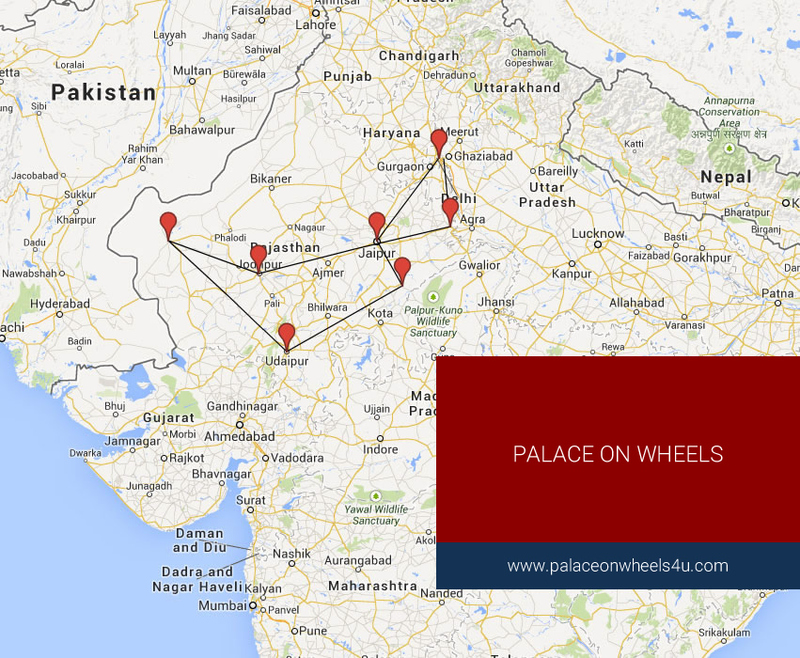 And the most interesting way to explore Rajasthan is on Palace of Wheels. It reflects the royalty and majesty of the bygone era when the kings and queens lived large. This Luxury train not only give you an exciting experience of a train journey but also take you to some of the most famous tourist attractions. Rediscover the age of decadence and romance. Step inside the Palace on Wheels and discover the elegance of the bygone era. This moving palace crosses through the land of Maharajas – Rajasthan and you travel in luxury & style and and no less a Maharaja for the royal treatment is the byword of this luxury train journey. Discover the vibrant colours of Rajasthan in a journey like no other as you travel on board the Palace on Wheels. The 7 nights journey on board the India Luxury Train the Palace on Wheels takes you into an Era of luxury and royal hospitality . Get away from the busy life. Take an amazing and relaxing trip enjoying the Culture & Heritage of Rajasthan and the World famous Taj Mahal. 4.00 PM Welcome on arrival at Safdarjung Railway Station. 4.30 PM Departure for Sight Seeing, Evening Tea at Fort. 11.00 AM Departure for Sightseeing-Visit to Fort of Agra. 11.00 PM Departure for Delhi from Agra Cantt. *** Accommodation in Air Conditioned Deluxe Cabin with attached bathroom in Palace on Wheels with All meals including tea, coffee and mineral water. Palace on Wheels has 14 residential cabins. Each and every saloon of the luxury train has been named after the erstwhile princely states. The names are Alwar, Bharatpur, Bikaner, Bundi, Dholpur, Dungerpur, Jaipur, Jaisalmer, Jhalawar, Jodhpur, Kishangarh, Kota, Sirohi and Udaipur. Each saloon has 04 twin bedded rooms along with one small seating area. Cabin size is 8 x 9. Serves chinese, continental, rajasthani & indian cuisine A well-stocked bar with T.V. facility, serves wine, liquor and spirits of Indian and international make Indoor games like Chess, Playing Cards. Chinese checkers, Carom Board, and Crossword Puzzles etc. are available on the train. A lounge for relaxing, interacting, making friends, getting together and play games. First aid is available on the train whereas a doctor can be arranged on call. At every Destination. Doctor is available for 1 hrs. for free consultancy in Bar/ Lounge car Mineral water is made available to all the passengers throughout the journey Leading newspapers & magazines of India are available on the train. Voltage available on the train: 110/230V The Palace On Wheels is a no smoking train. However , if you wish to smoke, please contact your captain for guidance. All essential toiletries like soaps, shampoos, moisturizers etc. are available in bathroom. The well-equipped spa offers various massages and therapies and revitalizing solutions amidst royal ambience. Mailing facility is provided on board, for posting your mail. The Leela Palace New Delhi is a blend of Lutyen’s architecture and the royal Indian culture. A pampering spa, 4 dining options and free parking are available. Elegantly decorated, air-conditioned rooms feature a high-definition flat-screen TV with a DVD player, floor-to-ceiling windows and wooden furnishings. A 2nd flat-screen TV in the bathroom is a mirror when turned off. The Leela Palace New Delhi is less than 10 minutes’ drive from the India Gate. Indira Gandhi International Airport is 15 km while the Domestic airport is 13 km. The exclusive spa by ESPA offers an Ayurveda inspired day spa menu created for both women and men while rooftop temperature-controlled swimming pool offers the panoramic views of the city’s skyline. Guests can also approach the 24-hour front desk to rent a computer or a car. Housed in a modern glass structure, The Qube offers an international and Indian buffet with open kitchens. Other dining options include Le Cirque and MEGU from New York, the award winning restaurants. Indian food is served at Jamavar . Drinks can be enjoyed at the hotel’s 2 bars. Hotel offers 254 Rooms.